For decades, business leaders believed that simply focusing on performance management was the key to building a successful company. If they just had the right vision and strategy, clear objectives, people with the skill sets to achieve those objectives, and alignment toward their goals throughout the entire organization, they'd achieve high employee performance, financial success, and live happily ever after. In the late 1980s, however, company culture emerged as another core element and predictor of organizational performance and success, and has since risen to one of the most talked about keys to building a successful organization in today's zeitgeist. There have now been numerous studies showing the correlation between great culture and high employee performance, with one example showing that since 1998, Fortune's 100 Best Companies To Work For (a decent proxy for companies with a strong culture) have outperformed the S&P 500 by 2 to 1. Then a decade later, Gallup began discussing the impact that employee engagement was having on business outcomes, further informing us of the abysmal statistic that barely more than 30% of today's workforce is engaged in their work. Even though it's now clear that both company culture and employee engagement are key factors, in addition to performance management, to creating successful outcomes, there's still a lot of confusion about how they relate with one another, and what leaders can do to positively influence all three. 1) Company leaders set the mission, vision, and long/medium/short term objectives for the company. 2) Managers hire for a specific skill set and specific roles. 3) Managers set objectives and key results (MBOs/OKRs) as well as determine which key performance indicators (KPIs) they will track that align individual employees and teams around the company mission, vision, and objectives. These objectives roll up and support growth and results simultaneously at the employee, team, and company levels. 4) Managers communicate and check-in with employees regularly on KPIs and OKRs. They diagnose and address roadblocks and keep employees on track. 5) Managers hold a yearly employee performance review with all of their reports to evaluate 12 months of work and set goals and expectations for the next 12 months. The commonplace belief is that if that process is executed flawlessly, success should be guaranteed. However it's now become apparent that if that's all that leaders do, they are setting themselves up for failure. Why is that? It's because both company culture and employee engagement are as important as performance management to creating successful outcomes, if not more so. Unfortunately most organizations still focus on culture, employee engagement and performance management as three independent and separate initiatives, not realizing how deeply interrelated they are. This causes frustration and failure when it comes to trying to put all the pieces together, often putting either too much attention on one part at the exclusion of the others or bouncing from one to the other without the consistent focus on all three that is required for success. If you're looking to achieve big outcomes, implementing KPIs, OKRs and/or other performance management practices are absolutely necessary. However if your people aren't engaged, there's very little likelihood of them achieving their objectives no matter how good your management systems are. Thus, high employee engagement is a vital predecessor for performance management practices to be effective. 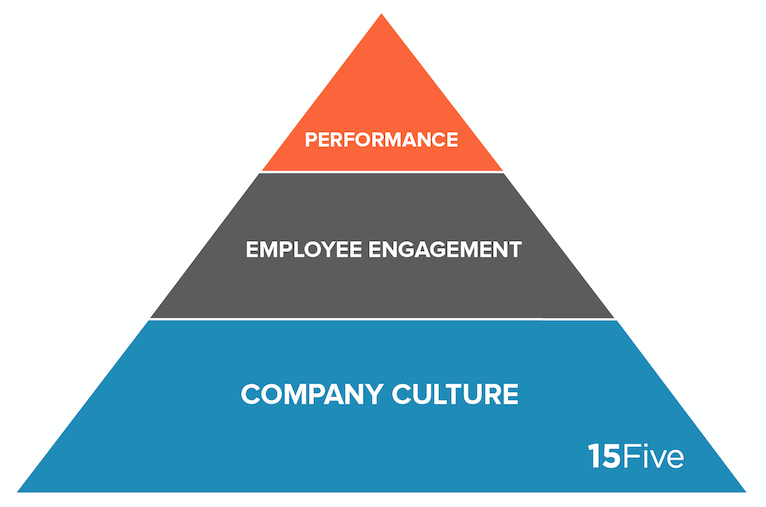 Just as high employee engagement is a prerequisite for performance management to be effective, a strong company culture is a prerequisite for high engagement to be possible. If the culture is negative, people might be "engaged" but it's very unlikely to be the type of engagement you're after as a leader. The interplay of building culture, fostering high employee engagement, and focusing on performance management (namely vision, strategy, objectives, alignment and execution), is in essence an ecosystem that must be focused on as a whole in order to ultimately achieve high performance. Similar to Maslow's Hierarchy of Needs, each layer forms the foundation for the next one above, making that next layer possible. This is the base of the pyramid, and the foundation on which everything else rests. The company's purpose (or WHY) and core values are the bedrock of the culture, but it's much deeper than simply what you post up on your company's wall or website. The true culture is an expression of what is actually valued, regardless of what's written down. For example, the company may declare transparency as a value, but are people actively engaging in candid, open communication or does gossip run rampant? How people interact with each other and the way they go about doing their work is the culture. That's not to say that a written purpose and set of values aren't important. They let you codify your culture by purposefully distinguishing the elements that are unique, strong and positive about your culture, and then act as touchstones to be used in the ongoing conversations and communication designed to continuously reinforce that culture. One way to assess the strength and alignment of a culture is to measure the difference between the stated values and the actual lived values. A good culture exists when the two are aligned, and it takes continuous steering to make sure the actual culture doesn't drift away from the stated ideal. An "engaged employee" is enthusiastic about their work and passionately furthers the organization's interests. When someone is engaged, you can feel it. It feels like they're leaning in and deeply care about their work, their team and the organization. In contrast, when people are disengaged the likelihood of their success is dramatically reduced even if they clearly know what they are supposed to achieve. Engagement can be difficult to measure because part of the problem is that engagement is based on each individual's subjective experience. There are many tools and methodologies out there for measuring it, but despite their sophistication, none are as powerful as a straightforward question -- "How do you feel about your work?" In this respect, managers are a bit like doctors. In modern medicine, the highest most sophisticated determinant of pain is not measured with fMRI machines or CAT-scans, but simply asking the patient to report their level of pain on a scale of 1-10. With all the tech available, the best diagnostic tool is still a subjective assessment. Some of the key drivers of engagement are more straightforward. Some elements that are prerequisites for engagement, like trust and transparency, are derived directly from the culture. Others have to do with how connected the person is to the team and the company, how well-matched they are for their role, and what their opportunities are for growth. For example, have you hired people who are passionate about the deeper purpose or the Why of the company? Do they feel like they belong, and do they have positive relationships with their peers and their manager? Are they in a role that leverages their unique abilities, and that also gives them an opportunity to continue to learn and grow over time? This sits at the top of the pyramid. It's the smallest of the three and the most concrete in terms of practices and measurements, and how easy it is to implement and adjust. Essentially managers set objectives and KPIs, manage execution, and look at metrics to see whether progress is being made and outcomes are being achieved. Think of performance management however as the tip of an iceberg. It's small, manageable, and easy to see. But because it's the the only part that you can easily see, many leaders make the fatal mistake of not realizing that culture and engagement are the hidden layers that determine whether or not performance management will even be effective at all. 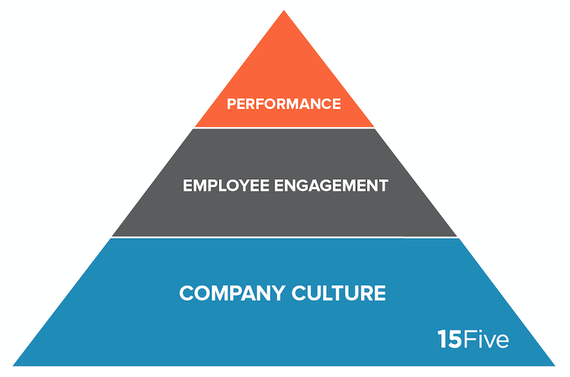 As opposed to focusing on all three of these elements -- company culture, employee engagement, and performance management -- separately and haphazardly, a holistic and coordinated approach ensures consistent results over time. Continuously focusing on and nurturing the company culture ensures that it stays strong and healthy, and gives rise to the possibility of high employee engagement. Ensuring that people are the right fit for the company and their role, have positive relationships with their peers and manager and feel that they're growing, creates the highest likelihood that they'll be engaged. When employees are engaged, they've got the drive and energy to not only move the needle on existing objectives, but to also innovate and create new opportunities for growth. With company culture and employee engagement firmly in place, performance management can be as simple as setting goals that people are eager to fulfill, lightly checking-in regularly to offer support, and trusting that they have the motivation, skills and desire to get the job done. David Hassell is founder & CEO of 15Five, employee engagement and feedback software that helps create high performing teams by combining pulse surveys, weekly check-ins, peer recognition, and people analytics all in one platform. Follow David on Twitter @dhassell.